Welcome to Year 1 Bats Class page. We're excited about our learning this half-term. Our two topics will be 'Bats' followed by 'Things That Fly'. Welcome to Spring Term. This is a short but busy term! We begin our science curriculum this half-term with lots of opportunities to carry out practical science. Below you will find the Parent Information Letter. Please note the key date for our next Learning Together which will be a morning session. Starting this half-term we have introduced 'Reading Heroes' for Bats Class. As an extra incentive to read, the children can earn special stickers and have themselves featured on our Heroes wall in class. All they need to do is to read twice a week to an adult but they must remember to get their reading diary signed. We'll count up weekly and see who can earn themselves a starring role on our Heroes display. 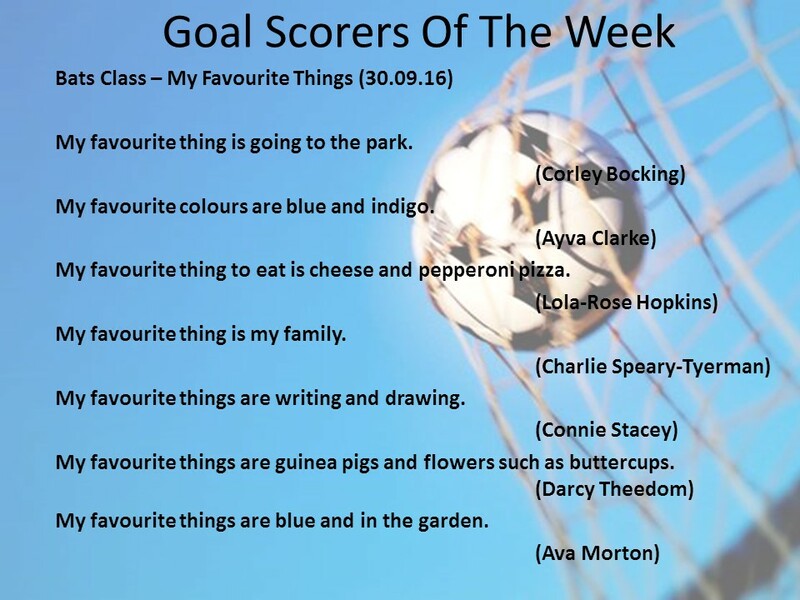 Goal Scorers of the Week - Favourite Things List. The children wrote about the story of 'Not Now Bernard' this week. We learnt the story in class during the week making a story map and using actions to help us sequence the story. It was brilliant Bats! Here are the Goal Scorers from our Big Write. After a brilliant start to Nativity rehearsals, we are counting down the days until our performances in December! This week we have been writing a description of a hero thinking about Remembrance Day. 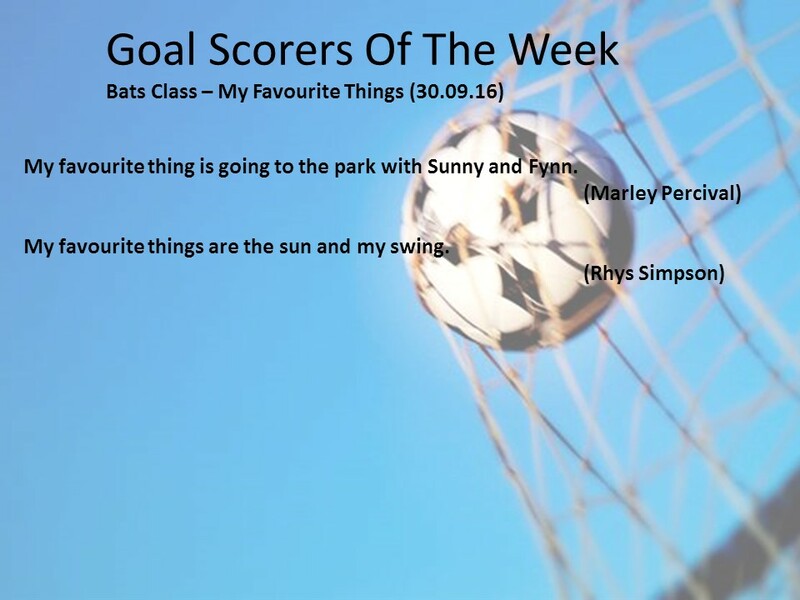 Here are this week's very thoughtful Goal Scorers of the Week. It has been a very busy last couple of weeks in Bats Class. The children were amazing in all of their Nativity performances. Our last piece of extended writing for the term centered around a story called 'Mrs Claus Saved the Day'. It was lovely to see a very busy writer's classroom. Bats Spring Term Learning Together. Thank you for joining us and supporting the children to make their clay flower sculptures. Here are a few photos of this term's session. Calling all Bats' families who need to spend their £1 pound coins pronto!! Come try then buy our delicious Bat snacks. We've made snacks for every superhero to keep hunger at bay while Bats save the day. Not forgetting every superhero's sidekick!! Bring plenty of change to stock up on your superhero Bat Snacks. There may even be some free samples to try!! See you in Bats Classroom from 13:30. Bats Class Easter Enterprise was a great success. Thank you for helping us enjoy the afternoon. Bats have had a busy start to the summer term. We have already written letters to the zoo to ask for the perfect pet so we are already immersed in learning as many animal related facts as we can. Our recent Big Write provided us with the perfect opportunity the use amazing adjectives to describe the delicious fruits and comical animals from the story of Handa's Surprise. Here are the Goal Scorers below.